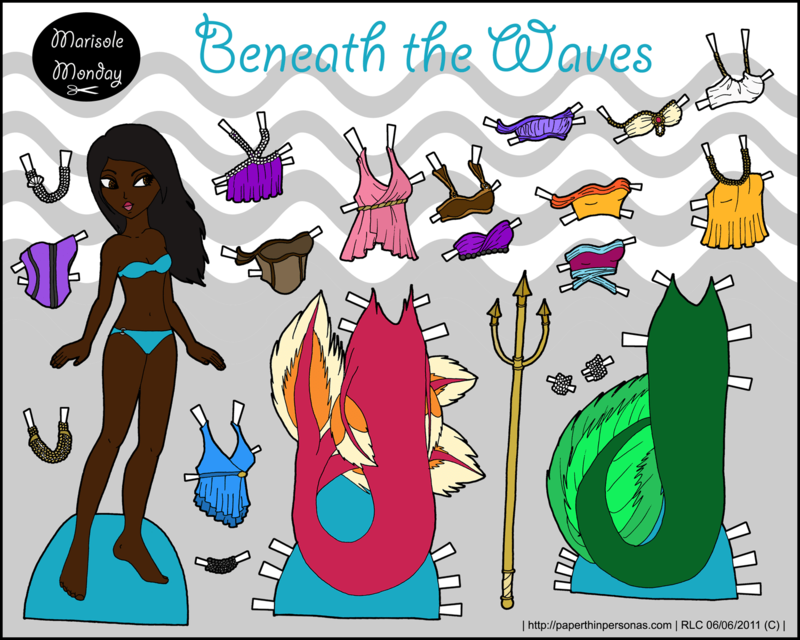 I was going to call this post Under the Sea, but I called my last mermaid paper doll Under the Sea. I didn’t think I could use the name twice, so I did the best I could with another, basically the same name. Synonyms… wonderful things. It took me a long time to decide to do a mermaid version of Marisole. It was requested by a few different people, but I put it off since I wasn’t sure how to make tails work with the paper doll’s leg pose. In the end, I drafted both tails in full size several times, before settling on these designs. I wanted to do one traditional green tail and one more tropical exotic tail in the colors of my pet beta fish, Levi. (His full name is Levithan, but I call him Levi for short.) He has more blue in him then the pink and gold of the tail, but I liked the bright colors and though the pale yellow looked wonderful with the pink. I strongly recommend taking an exact-o knife, or a pair of scissors, and cutting up along the side of the paper doll’s body between her arm and stomach. That way the tops and tails will both fit much better. The placement of the right arm is one of my major frustrations with Marisole. She needs to be redesigned, but that isn’t going to happen anytime soon. Edit: This paper doll is now available in black and white to be colored. She’s so great. I love the pink tail. You should do more mermaids. Thank you both. I’m glad people are enjoying my little foray into Mermaids. Ooh, this is pretty! I get stuck with mermaid tails, this is good inspiration. Thank you so much. I am baby sitting a 6 year old tonight and had no idea how I was going to entertain her. I have no kids and no kid stuff here. I came across these on line and let me tell you they where a huge hit with her and a big save for me! I’ve been informed before that paper dolls and crayons are a great way to occupy children.